Anonymous : We have Revolution in mind, we can change the World ! They are Internet Heroes, hackers and hijackers, information rebels, revolutionaries and resisters. They are you, me, the grunt in the next cubicle, the geek who fixes your computer. They are Anonymous, an informal collective of interactivists that last month virtually armed protestors in Tunisia and Egypt with the necessary knowledge to topple governments: How to keep safe during protests. How to bypass censors. How not to leave an online trail. How to keep posting YouTubes when the dictators have pulled the Internet plug. We r Anonymous Hackers,bt we dnt Hack the Humanity.. They are liberators, truth-seekers freedom fighters. Freedom of expression, freedom of information, freedom of the press, freedom of the people. The thing is there is no “they.” Anonymous is a cyber blob, amorphous, a concept, a consensus, a consciousness, a collaboration, a strategy, a meme. Individuals come and go. They meet in Internet chat rooms, or not. They post on forums, or not. They tweet and Skype and text, or not. They don the Guy Fawkes mask from the movie V for Vendetta and hit the streets. Barrett Brown, co-author of Flock of Dodos: Behind Modern Creationism, Intelligent Design and the Easter Bunny, says he is often referred to as a “spokesperson and strategist’’ for Anonymous. He has certainly written much about it, in The Guardian, The Huffington Post and other publications. But is Anonymous, whose numbers are typically estimated at 10,000, an organization in the classic organized sense? Overwhelming offending websites with hits until they overload. Hacking into computer networks and leaking classified documents and emails. Jamming fax machines with all-black transmissions. Making prank phone calls and exposing their targets’ innermost — and dirtiest — secrets. And there are PDFs, lots of PDFs, hard-copy guides to revolution that 1960s Yippies like Abbie (Steal this Book) Hoffman could not have imagined. Riot advice. “First Aid Made Easy.” “The Uber Secret Handbook.” Even print-and-cut-out Guy Fawkes masks. Anonymous has proven its power time and again, operation after operation. Not just in the Arab uprisings by closing down government and counter-revolutionary websites, but also by taking out business sites that, for example, stemmed support for WikiLeaks. WikiLeaks, you see, represents everything Anonymous stands for — the absolute power to publish withour fear, favour or the heavy hand of the state. “For the first time in history, politicians (and others) have to answer directly to the people who elected them, a reality that’s creating shockwaves which are rocking the Powers-that-Used-To-Be to their cores,’’ explains Vancouver Island-based Jon Newton, who runs the digital news site p2p.net. Mainstream media usually treat Anonymous as a threat to the system. But maybe the corporate media have it right. Maybe Anonymous will change the established order of things. 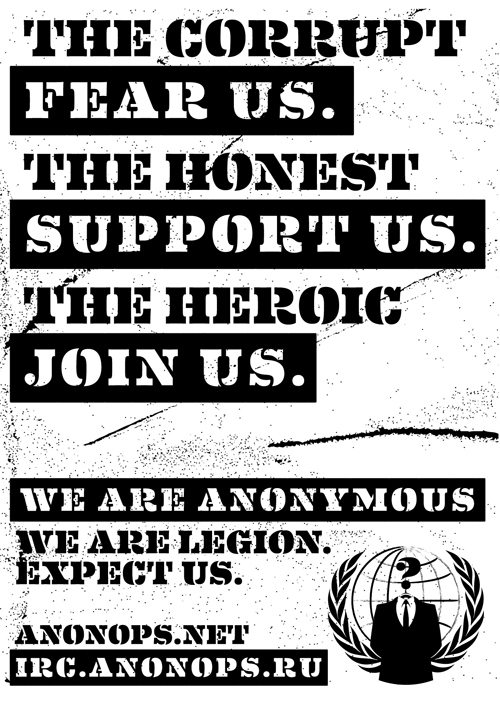 Maybe Anonymous is the warrior of the future. One thing’s sure: Anonymous is spreading. “I think we’re going toward perpetual revolution,” says Brown. “The nation-state is an institution that developed in a different environment. That environment has changed very drastically. And it’s changed more drastically in a very short period than any change we’ve seen in human history.